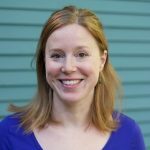 ACEEE visiting fellow Anna Chittum tackles one of the most daunting industry problems: determining the economic value of microgrid resilience. Yes, it can be done. Microgrids are increasingly deployed for their resiliency and reliability benefits — particularly those microgrids anchored by combined heat and power (CHP). But it hasn’t been easy to value microgrid resilience. How much is it worth not to lose power when the grid goes down? Answering that question could mean the difference between a “yes” or a “no” by a company or community considering investing in a microgrid. There’s no need to start from scratch, as existing financial tools and methodologies already produce robust valuations of resiliency benefits. 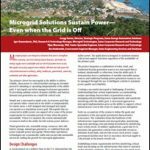 This article will explore actions microgrid and CHP developers can take today to help jump-start the work of better valuing microgrid resilience. To be sure, the U.S. power system is a marvel of our developed economy. But its reliability is considerably worse than the systems of many of our peer economies. This is particularly true for certain utilities, which perform far worse on reliability indices than the average utility in other developed countries. (These other countries have far fewer individual utilities and generally less variation among utilities. So comparing single U.S. utilities to national averages makes sense). Before we look at some data, it will help to understand two reliability standards used by grid operators throughout the world. SAIDI = System Average Interruption Duration Index = the average number of minutes of power outages experienced by the average customer each year in a utility service territory. SAIFI = System Average Interruption Frequency Index = the average number of interruptions a customer experiences each year in a utility service territory. 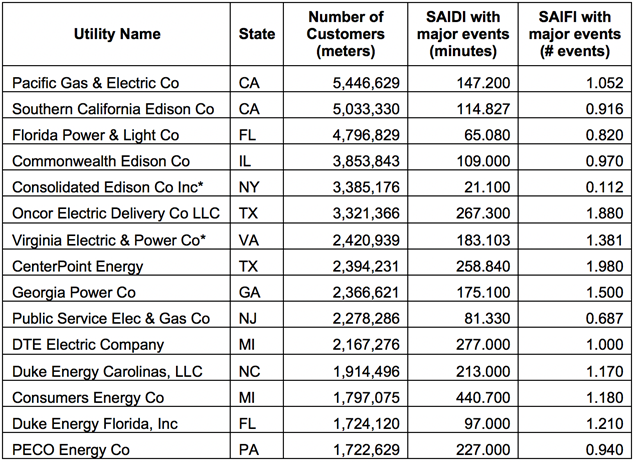 Table 1 below summarizes the SAIDI and SAIFI numbers for the 15 largest U.S. utilities and includes the impact of ‘major’ events such as substantial storms. Table data source: U.S. Energy Information Administration Form EIA-861 *Not IEEE standard (these utilities define SAIDI and SAIFI outside of the established IEEE Standard 1366 definitions). Of the largest 15 utilities, Consumers Energy has the highest SAIDI — 440 minutes of outages for the average customer in 2015. Five other utilities saw customers experience more than 200 minutes of outages. These numbers are not great: Many European countries have average SAIDI numbers that look much better than those in Table 1. Figure 1 below shows the best-performing European countries and, like Table 1, includes major events. The best performing European countries have SAIDI numbers at or below 100 minutes. Many of them are well below 50 minutes. On the other side of the world, Japan’s Tokyo Electric Power Company, which serves 45 million people – more than one third of Japan’s population – has made significant investments in system reliability. In 2014, its reliability numbers were exceptional, with a SAIDI of only 4 minutes and a SAIFI of 0.07. The average (unweighted) SAIDI for the largest 15 American utilities, meanwhile, was about 179 minutes, well above that of Japan or any of the top-performing European countries. A handful of U.S. utilities do perform exceptionally well on reliability. But there’s an enormous difference between the best and the worst-performing utilities. Figure 2, below, shows the difference in SAIDI for about 100 utilities that annually report their reliability performance. These utilities represent a variety of regions, generation resources, and service-territory sizes. Source: IEEE Benchmark Year 2016 Results for 2015 Data. Note: bar colors correspond to U.S. region. In the first two quartiles, the difference in SAIDI between any two utilities is about 100 minutes at most. But the difference in SAIDI between utilities in the first two quartiles and the fourth quartile can reach 700 minutes or more. This wide disparity suggests that for facilities and communities thinking about their vulnerability to blackouts and the value of investing in their own onsite generation, the reliability performance of their specific utilities needs to be analyzed to inform any investment decisions. What can microgrid developers do today? Utilize the Performance Excellence in Electricity Renewal (PEER) rating process, which rates electric systems on their exhibited reliability (e.g. SAIDI/SAIFI), as well as their ability to black-start and island critical loads during outages. The PEER system enables comparisons among electric systems to better measure local reliability performance. It can also rate the performance of an individual microgrid once in operation. Our grid does not perform nearly as well as it could, and there is an immense cost to its poor performance, whether from a wind storm or a hacking event. This year for the first time in 10 years, the Lawrence Berkeley National Laboratory will publish an important update to a comprehensive study that calculated the actual reported cost of power outages to U.S. customers. Using data derived from utilities themselves, preliminary results show that the cost of power outages in the U.S. is about $110 billion per year (in 2014 dollars). This analysis is derived primarily from the costs of short-term outages and does not reflect the broader costs to customers and society of major outages like Superstorm Sandy that last longer than 24 hours. Blackouts affect different types of facilities in very different ways. A 2015 meta-analysis (also from the Lawrence Berkeley National Laboratory) of utility-derived value-of-service estimates broken down by size and sector shows how widely outages can vary in their costs to customers. For instance, as seen in Table 2, a 16-hour outage can cost a large commercial and industrial customer as much as $165,000, compared to just $32 for an average residential customer. Use existing cost-of-service assessments from utilities and tools like the Interruption Cost Estimate (ICE) calculator. This tool is maintained by Nexant and populated with the above-mentioned Lawrence Berkeley National Laboratory data to develop models of different kinds of users. It estimates the benefits of avoiding outages without extensive and costly facility-specific data collection. Consider tools like Hartford Steam Boiler’s Blackout Risk Model, developed in partnership with Atmospheric and Environmental Research (AER) to help companies model the financial impact of a blackout. We know microgrids and CHP systems bring broad societal benefits during extended outages. This was most recently apparent during Superstorm Sandy , when CHP and CHP-based microgrids helped critical facilities avoid blackouts. Use the existing New York Prize cost-benefit framework, which was developed by Industrial Economics, and assigns a dollar amount to societal benefits, like avoided deaths. For instance, the framework allows a hospital to value the heart attack caused deaths avoided by staying online during a grid outage. Consider the utility-level distribution planning underway in California, where regulated electric utilities must develop distribution resource plans. These plans consider benefits such as avoided public safety costs, avoided substation investments, and broader societal avoided costs that can include resiliency benefits. Utilities are developing their own dynamic avoided-cost models that ascribe value to these resiliency and reliability benefits. Individual facilities and their insurance companies generally make no distinction between traditional backup diesel generation and a continuously running CHP or CHP-based microgrid system. Nor do policymakers.That’s typically due to a lack of understanding of the premium resilience benefits CHP and microgrid systems offer compared to regular backup generation resources. This is a big miss, because there is evidence that the failure rate of traditional backup diesel generators is high (at least 15 percent). Since microgrids and CHP systems are regularly used and maintained, they tend to perform better than rarely used backups during times of emergency. However, there is a shortage of quantitative information about how microgrid and CHP projects perform in situ. 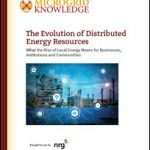 Absent sufficient data on how microgrid systems perform, what can microgrid developers do today? Use publicly available data from existing CHP programs such as California’s Self-Generation Incentive Program and the New York CHP programs and microgrid deployment programs to fill data holes; programs like the New York Prize program make public their feasibility studies and will make public performance data once projects are operational. Work with insurance companies that are comfortable underwriting performance risk of energy efficiency and distributed generation projects. Those included insurers such as Energi and Hartford Steam Boiler (HSB), which have analyzed enough CHP systems to underwrite performance based on the selected equipment and application. Despite the above resources, the CHP and microgrid industries still can’t compare resiliency benefits across projects and between resource types. For resiliency and reliability to enter cost-benefit tests as a quantified value, we need a more standardized approach to measuring and describing resiliency. To more aggressively encourage microgrids in energy resource planning, policymakers must have standardized performance data to feel confident in their performance and reliability claims. The time is right for the microgrid and CHP industries to work to share information about the performance of existing systems and company-specific reliability valuation methodologies. This effort would complement and leverage broader corporate social-responsibility trends, which are standardizing measures of environmental performance across industries and corporations. Groups like the Sustainability Accounting Standards Board (SASB) aim to standardize and improve individual corporations’ disclosure on financial statements to better inform investors about their environmental performance, including energy-related liabilities. The above-mentioned PEER effort also aims to standardize comparison among electric systems for individual facility decision-making and to enable benchmarking among a wide variety of electric systems, including microgrids. The industry should take the lead in developing this metric, which should include the resiliency benefits of all distributed energy resources for a given project. We propose the development of an industry-led Distributed Energy Resource Resilience Value, or DERRV, framework. With funding from the New York State Energy Research and Development Authority (NYSERDA), the American Council for an Energy-Efficient Economy (ACEEE) is researching the way CHP and microgrid resilience and reliability are currently being valued and how they could be valued in the future. Next month ACEEE will publish an overview of some suggested next steps the industry could take today. To learn more about this effort, contact Anna Chittum at achittum@aceee.org. Instapoll on Reliable Electric Service: What Would You Pay?